Happy Throwback Thursday! This feature (created by It’s Book Talk) is intended to highlight an older title that deserves another moment in the spotlight. For this week’s Throwback Thursday pick, I’m recommending a brilliant Nordic Noir book from my favorite crime book publisher, Orenda Books: THE BIRD TRIBUNAL by Agnes Ravatn. Thanks to the publisher, I'm also sharing an excerpt of the book's first four chapters so you can see if this unique read is for you! There’s something captivating about THE BIRD TRIBUNAL. 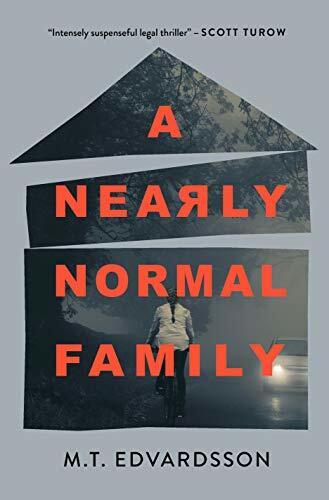 Its writing is atmospheric and moody, drawing the reader bit by bit into the all-consuming isolation that wraps itself around the story’s main characters; its characters themselves are a touch quirky and completely fascinating. This short little book packs an emotional punch, brilliantly blending the atmosphere of Norway with a plot that’s almost better suited to the label “domestic thriller” than “Nordic Noir.” I highly recommend this book for readers looking to be absorbed in a lyrical, emotive suspense novel that centers around two strangers brought together under odd circumstances, living in solitude with nothing but one another’s secrets for company. Brimming with steadily-building tension and breathless suspense, THE BIRD TRIBUNAL is a genuinely original and fresh addition to any crime reader’s library. Thanks to Orenda Books, I’m thrilled to share the first four chapters from THE BIRD TRIBUNAL with you today! Read on to see for yourself what makes this such a compelling and truly unique read. And as a reminder: no portion of the below excerpt may be reproduced without the publisher’s permission. My pulse raced as I traipsed through the silent forest. The occasional screech of a bird, and, other than that, only naked, grey deciduous trees, spindly young saplings and the odd blue-green sprig of juniper in the muted April sunlight. Where the narrow path rounded a boulder, an overgrown alley of straight, white birch trees came into view, each with a knot of branches protruding from the top like the tangled beginnings of birds’ nests. At the end of the alley of trees was a faded-white picket fence with a gate. Beyond the gate was the house, a small, old-fashioned wooden villa with a traditional slate roof. Silently I closed the gate behind me and walked towards the house, making my way up the few steps to the door. I knocked, but nobody opened; my heart sank. I placed my bag on the porch steps and walked back down them, then followed the stone slabs that formed a pathway around the house. At the front of the property, the landscape opened up. Violet mountains with a scattering of snow on their peaks lay across the fjord. Dense undergrowth surrounded the property on both sides. He was standing at the bottom of the garden by a few slender trees, a long back in a dark-blue woollen jumper. He jumped when I called out to greet him, then turned around, lifted a hand and trudged in a pair of heavy boots across the yellow-grey ground towards me. I took a deep breath. The face and body of a man somewhere in his forties, a man who didn’t look as if he were in the slightest need of nursing. I disguised my surprise with a smile and took a few steps towards him. He was dark and stocky. He didn’t look me in the eye but instead stared straight past me as he offered me an outstretched hand. Allis Hagtorn, I said, lightly squeezing his large hand. Nothing in his expression suggested that he recognised me. Perhaps he was just a good actor. The garden behind him was a grey winter tragedy of dead shrubbery, sodden straw and tangled rose thickets. When spring arrived, as it soon would, the garden would become a jungle. He caught my worried expression. Yes. Lots to be taken care of. The garden is my wife’s domain. You can see why I need somebody to help out with it while she’s away. I followed him around the house. He picked up my bags, one in each hand, then stepped into the hallway. He showed me up to my room, marching up the old staircase. It was simply furnished with a narrow bed, a chest of drawers and a desk. It smelled clean. The bed had been made up with floral sheets. He turned without replying, bowing his head and stepping out of the room, then nodded towards my bathroom and walked down the stairs, without indicating what was through the other door on the landing. I followed close behind him, out of the house and around the corner, across the garden and over to the small tool shed. The wooden door creaked as he opened it and pointed at the wall: rake, shovel, crowbar. For the longer grass you’ll need the scythe, if you know how to use it. You’ll find most of what you need in here. Garden shears and the like, he continued. It would be good if you could neaten up the hedge. Tell me if there’s anything else you need and I’ll see that you get the money to buy it. He didn’t seem particularly bothered about making eye contact with me as he spoke. I was the help; it was important to establish a certain distance from the outset. Were there many responses to your advertisement? I asked, the question slipping out. He cast me a fleeting glance from under the dark hair that fell over his forehead. His arrogance seemed put on. But I kept my thoughts to myself: I was his property now – he could do as he liked. We continued making our way around the house and down into the garden, past the berries and fruit trees by the dry stone wall. The air was crisp and bracing, infused with the scent of damp earth and dead grass. He straddled a low, wrought-iron gate and turned back to look at me. Rusted shut, he said, maybe you can do something about it. I stepped over the gate and followed him. Steep stone steps led from the corner of the garden down to the fjord. I counted the steps on my way down: one hundred exactly. We arrived at a small, stone jetty with a run-down boathouse and a boat landing to its right. The rock walls of the fjord formed a semicircle around us, shielding the jetty from view on both sides. It reminded me of where I had first learned to swim almost thirty years before, near my parents’ friends’ summer house on a family holiday. It’s so beautiful out here. I’m thinking about knocking down the boathouse one of these days, he said, facing away from me. The breeze from the fjord ruffled his hair. No, he replied, curtly. Well. There’s not much for you to be getting on with down here. But now you’ve seen it, in any case. He turned around and started making his way back up the steps. His bedroom was on the ground floor. He motioned towards the closed door, just past the kitchen and living room and presumably facing out onto the garden. He accessed his workroom through his bedroom, he told me. I spend most of my time in there. You won’t see much of me, and I’d like as few interruptions as possible. I gave one deliberate nod, as if to demonstrate that I grasped the significance of his instructions. I don’t have a car, unfortunately, but there’s a bicycle with saddle-bags. The shop is two kilometres north, just along the main road. I’d like breakfast at eight o’clock: two hard-boiled eggs, pickled herring, two slices of dark rye bread and black coffee, he quickly listed. The weekends are essentially yours to do as you please, but if you’re around then you can serve breakfast an hour later than usual. At one o’clock I have a light lunch. Dinner is at six, followed by coffee and brandy. After reeling off his requirements he disappeared into his work-room, and I was left in peace to acquaint myself with the kitchen. Most of the utensils were well used but still in good shape. I opened drawers and cupboard doors, trying to make as little noise as possible all the while. In the fridge I found the cod fillet that we were to share for dinner that evening. The tablecloths lay folded in the bottom kitchen drawer, I picked one out and smoothed it over the kitchen table before setting two places as quietly as possible. At six o’clock on the dot he emerged from his bedroom, pulled out a chair and took a seat at the head of the table. He waited. I placed the dish containing the fish in the middle of the table, then put the bowl of potatoes in front of him. I pulled out my chair and was about to sit down when he halted me with an abrupt wave. No. You eat afterwards. He stared straight ahead, making no eye contact. My mistake. Perhaps I wasn’t clear about that fact. I felt a lump form in my throat, picked up my plate and quickly moved it over to the kitchen worktop without uttering a word, a tall, miserable wretch, my head bowed. I filled the sink with water and washed the saucepan and spoons as he ate. He sat straight-backed, eating without a sound, never once glancing up. Fumbling slightly, I set the coffee to brew, found the brandy in the glass cabinet behind him and, once he had put down his cutlery, cleared the table. I poured coffee in a cup and brandy in a delicate glass, then placed both on a tray and picked it up with shaking hands, clattering in his direction. When he stood up afterwards, thanked me brusquely for the meal and returned to his workroom, I took my plate to the table and ate my own lukewarm portion, pouring the half-melted butter over the remaining potatoes. I finished the remainder of the washing up, wiped the table and worktop and headed up to my room. I unpacked all of my things and placed the clothes, socks and underwear in the chest of drawers, the books in a pile on the desk. I made sure my mobile phone was switched off before putting it away inside the desk drawer. I wouldn’t be switching it on again any time soon, not unless there was an emergency. I sat there, perfectly still and silent, afraid to make a sound. I could hear nothing from the floor below my own. Eventually I made my way to the bathroom before turning in for the night. board at home just a few evenings ago when packing to come here, along with a paint-splattered shirt. My parents had bid me a relieved farewell as I had left to catch the bus the following morning. I started to feel my efforts in my back. Sweat beneath my shirt. Tiny insects buzzing all around me, landing in my hair, on my forehead, itching. I was constantly having to stop what I was doing to take off my gloves and scratch my face. The long, golden wisps of straw almost seemed to mock me as they swayed gently in the light breeze. I continued to swing the blade with all my might. I’d try the rake if I were you. I spun around to find Bagge standing behind me. I must have looked deranged, spinning around red-faced and decked out in fifteen-year-old rags. My fringe was clinging to my face. Without thinking, I swept it aside with my hand and felt the earth from the gloves smear across my forehead. The scythe’s no good when the grass is wet. No. I tried my best to muster a smile, resigned in the face of my own stupidity. And don’t forget lunch, he said, lightly tapping his wrist to remind me of the time. He turned around and walked away. I quickly glanced up at the house, the window to his workroom. He had been standing there, staring down at me in disbelief as I ignorantly forged ahead with my attempts at gardening until he could take no more. Shame crept over me. I picked up the scythe and carried it to the tool shed, hanging it back in its place on the wall. I picked up the iron rake and returned to where I had been working, tearing it roughly over the ground until I had filled the wheelbarrow with lifeless, slippery stalks of grass. The bicycle was just behind the tool shed, propped up against the wood stack, an old, lightweight, grey Peugeot with narrow road tyres and ram’s horn handlebars. The cycle to the shop only took ten minutes or so. It was a small grocery shop on a corner, just across the bridge, the kind of place that time has forgotten. A bell tinkled above me as I pushed the door open. There were no other customers. An elderly lady stationed behind the counter offered me the briefest of nods as I entered. There were shelves stocked with packaged food, napkins and candles, a small selection of bread and dairy products; there was a freezer cabinet, and fruit and vegetables with a set of scales for customers to weigh their own items. The shopkeeper’s eagle-eyed glare prickled at my back, her eyes following me as I wandered between the half-empty rows of shelves. There was no mistaking her critical air. She knew who I was. I felt a knot forming inside me, tightening, plucked a few items from the shelves and placed them in my basket, every move wooden, my only desire to put down my basket and leave. Eventually I approached her to pay, placing the contents of my basket on the counter without looking her in the eye. She entered the prices of each item into the register, her expression unreadable. Wrinkled hands and a wrinkled face, a small mouth that drooped downwards at both corners. It was just her way, I suddenly thought to myself, relief washing over me, it was nothing to do with me, it was just the way she was. I raced home, flying along on the thin bicycle tyres, with the fjord to my left and the dark, glistening-wet rock wall to the right, my shopping packed away in the saddlebag by the back wheel, cars passing me on the road that connected the two neighbouring towns. I hurtled down the steep driveway through the forest before stopping my bicycle by the wood stack, crunching over the gravel, opening the door into the hallway and making my way through the house. Something wasn’t right about this place; it was home to a married couple, yet the garden was a neglected mess, they owned no car and he locked himself in his workroom all day long. His wife away like this. I put the shopping away and started preparing dinner. It felt impossible to move. My body was as stiff and leaden as the rusted wrought-iron gate. For a long while I lay and gazed up at the knots in the wooden ceiling planks before finally managing to roll myself across the mattress and down onto the floor. Ridiculous. When had I last done any kind of manual labour? Never, that’s when; or at least not until deciding to rake grass and dig away at solid earth for hours on end. I staggered without a smidgen of grace between the kitchen and the table as I served his breakfast. Shame coursed through me; I knew that my ungainly hobbling vexed him. As I went to pour his coffee I let out a groan; it was hard to tell which of us was more embarrassed. I think I went at things a little too enthusiastically in the garden yesterday, I mumbled apologetically. He cleared his throat and stared straight past me. After his breakfast he returned to his room without a word. Drinking the bitter coffee in solitude after he had left the room, my good spirits wavered. I had been so proud of my efforts the previous day, clearing the area of dead grass, all the while hoping that he’d catch a glimpse of me in action from his window. My back was so, so stiff. The following day was worse. The simple act of placing one foot in front of the other was an almost unbearable ordeal, and I avoided sitting down all day long because I knew that I’d never be able to get back up again. My passion for gardening had lasted all of one day. It was always the way with me. I launched myself at things with gusto yet never saw anything through, always started with the same unbridled enthusiasm before swiftly giving up. I possessed no sense of perseverance, no will to accomplish anything in full. It was precisely this aspect of my character – an absence of resolve, my lack of self-discipline – that I had hoped might be transformed. But here was the thing: it required willpower to build willpower. A more dependable person, that’s what I had to become, a woman in possession of a firmer character. If not now, then when? Out here I had what little I needed: solitude, long days at my disposal, a small number of predictable duties. I was liberated from the watchful gaze of others, free from their idle chit-chat, and I had a garden all of my own. Like what you just read? You can find THE BIRD TRIBUNAL on Amazon, BookDepository, Barnes & Noble, and more! Many thanks to Orenda Books for providing the above excerpt.